Today’s Photo Challenge topic is “Smile”. So I thought I pick something that makes me smile and where people smile too. This picture was taken on a school trip with my primary school. The Paper the guy in green hold probably reads something like “Bad Orb, Class 3, 1992”. I just looked it up: the place still exists: Schullandheim Wegscheide near Bad Orb. 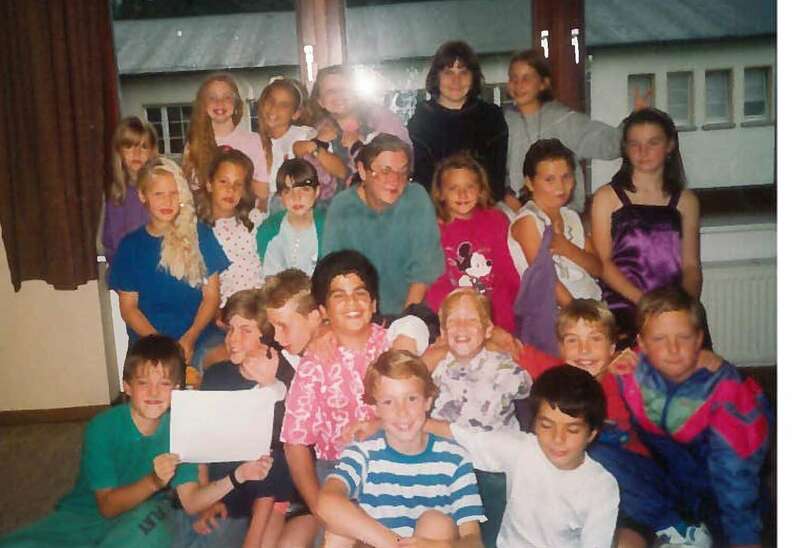 And look at us, how we are all dress up for disco night in what we thought, at the age of 9, was the height of fashion. I really wonder what has happend to all this people here. I only know that the third little girl grinning in the last row is the mum of that cute little baby that now sleeps under my crochet blanket. I can’t even name them all anymore. But maybe I should try to find them on Facebook. Can you guess which one I am? One tip: my hair is longer than it has ever been afterwards. This entry was posted in At home and tagged May Photo Challenge, Memories by kathatravelling. Bookmark the permalink. Great picture. Gotta love the fashions we thought were so stylish at the time.